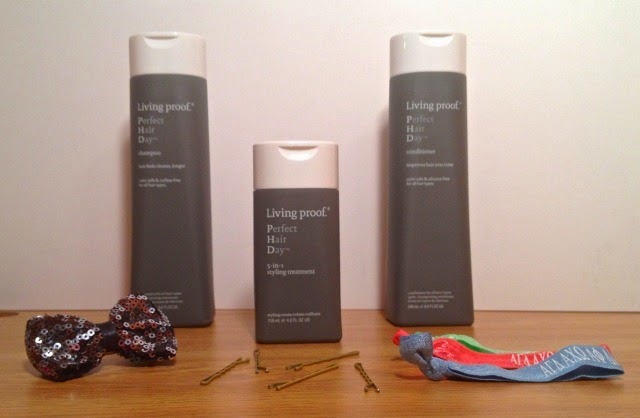 Living Proof was actually founded by scientists in Cambridge, MA who discovered two proprietary ingredients that have never been used before in beauty: with a healthy hair molecule called OFPMA. Needless to say I was beyond excited when I received a box filled with Living Proof hair products including their PhD shampoo, PhD conditioner, and PhD 5-in-1 Styling Treatment. I've been dying to try their products because they are free of sulfates, silicones, and oils, and Jennifer Aniston is co-owner. Jennifer always has goddess worthy hair and now we all can by using the same products she does! When I first opened the products I had to smell them right away, which I know may sound odd, but I wanted to make sure they smelled good before I used them. I have to tell you they did not disappoint - they smell wonderful and make my hair smell amazing! I've never had my hair hold a product scent like it does when I use these. My favorite part about this line is the fact that they do not use any sulfates in their products like I mentioned above; I have an allergy to sulfates so I always love finding new products that I can actually use. I would have to say these are honestly the best sulfate free hair products I have tried, I had no itchiness or redness on my scalp, even after going a few days without washing. Additionally my hair still looks great even after a few days because Living Proof's PhD shampoo and conditioner keep hair cleaner, longer meaning you don't need to wash your hair as often! When applying Living Proof styling products like their PhD 5-in-1 Styling Treatment on damp hair, after using the shampoo and conditioner, you only need to use a small amount. I have a tendency to be heavy handed when applying products, so I learned after my first use that I needed to only use a pea-sized amount or it was too much for my hair to handle. I really like that you don't need to use a lot because it will allow the bottle to last longer. All of the PhD products treat and style your hair to deliver smoothness, volume, conditioning, strength, and polish. I have to say that I immediately noticed a difference in the texture of my hair, which I've never had before from other shampoos and conditioners. I even feel like it makes drying your hair quicker and easier. Since using Living Proof PhD I've definitely been having perfect hair days (PhD). For the chance to be one of 10 winners that receive Living Proof's PhD shampoo, PhD conditioner, and PhD 5-in-1 Styling Treatment enter here! When you sign up you will only be entered to win these great products, but you will get a code for a free gift with your purchase from Living Proof's website. Now everyone can have a perfect hair day! I am going to keep using my Living Proof products and report back in a few weeks with all the other amazing benefits they products have to offer! Have you ever used any Living Proof products? I always love trying new hair products and this seems like a great one. Jennifer Aniston's hair is always so flawless! I love love love this line of products! The pink Restore one is my fav! I've been using it forever. It keeps my hair from getting greasy, and my hair looks so healthy! This looks like an amazing product! Cant wait to check this out! I've seen advertisements for Living Proof, but never really paid attention to it. Maybe it's something I will think about purchasing. Sulfate free is important to me also. Color lasts longer and hair is so much healthier! I've heard of this before, I had no idea Jennifer Aniston was a co-owner of the company! Jennifer Aniston is so gorgeous and always has flawless hair…. I should really try this stuff! !